Pl. Hort. Schoenbr. 4: 6, t. 411 1804. Origin and Habitat: Republic of South Africa. Western Transvaal, Orange Free State, northern and eastern Cape. Habitat and ecology: Haemanthus humilis grows in rocky situations where its bulbs are protected from predation by porcupines. It is widespread but occurs in isolated and localised populations in specialised habitats, which may explain the great variation between populations. These bulbs begin to grow during mid or late summer. At this time of year they are experience the heat of summer and cool nights, at a time when autumn is imminent. (Approximately a month or two away). They then grow vigorously and develop full leaves to take advantage of the waning summer sun. By the early spring the bulbs have reached their peak in the growing season, Seed has usually been set and dispersed by this time also. During some seasons the leaves can persist until late spring or early summer. J. S. African Bot. 12: 32 1984. 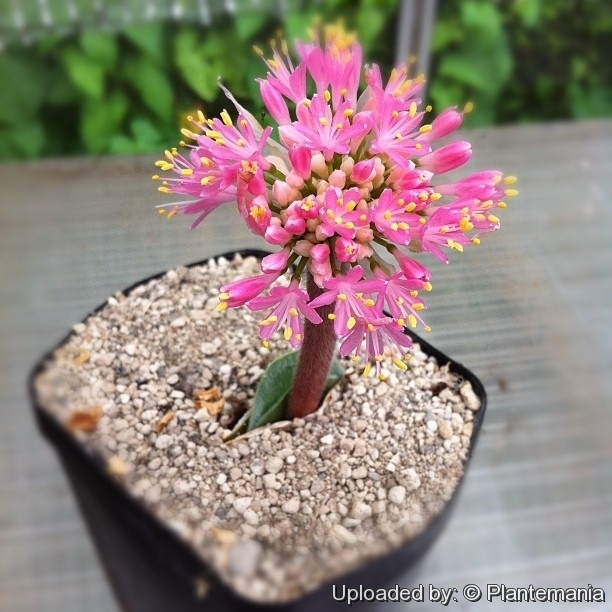 Description: Haemanthus humilis is a small perennial, geophytic, bulb up to 30 cm tall with flower-heads of pink flowers popping up from underground bulbs in late summer. Flowers are white to deep pink with stamens well exserted or equal in length to the segments. Flowers are mostly present with the leaves or appear slightly before. 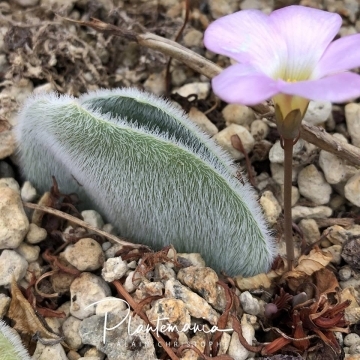 There are however many different forms or subspecies of Haemanthus humilis. The leaves are blunt rounded, medium to light green, from smooth to densely hairy, flat on the ground, arched or upright, small to large, the giant form listed which eventually grow leaves the size of kitchen chair. There are two subspecies, the nominate and subs. hirsutus, that can be differentiated based on their inflorescence, number of spathe valves, and stamen exsertions. Bulb: Round, ovoid, 2.5-8 cm in diameter, horizontally truncate.Tunics (scales) more or less equal. Inflorescences: Peduncle much compressed, erect or slightly curved, pale green to reddish purple 5-30 cm long, usually densely hairy appearing with the new leaves. Umbel loose, hemispherical, with 20-120 flowers. Pedicels nearly as long as the flowers. Spathe valves 4-7(-10) membranous, subequal, lanceolate, spreading or curved downwards pale red, 2-3 cm long,3-15 mm wide, narrowly to broadly triangular or lanceolate, acute. Flowers: Rose-pink to white. Perianth 7-16(-18) mm long. Tube 1-6(-12) mm long. Perianth segments, linear 4-10(-17) mm long, slightly spreading. Stamens equalling the perianth segments or exserted by up to 5-15 mm. Filaments white. Anthers oblong, yellow. Style as long as the stamens. Blooming season: Late summer (in habitat mostly from late January to February). Fruit (berry). Greenish white to cream or orange. Seed: Solitary, subglobose, brown, shining. Similar species: Haemanthus carneus has been narrowly classed as a species closely allied to H. humilis. The flowers, in particular the length of the stamens, separates H. carneus from H. humilis. The plants themselves (in foliage) are also very much like H. humilis. Haemanthus humilis Jacq. : Flowers rose-pink to white. Stamens equalling the perianth segments or exserted by up to 5-15 mm. Distribution: Western Transvaal, Orange Free State, northern and eastern Cape. Haemanthus humilis subs. hirsutus (Baker) Snijman: Leaves can be either entirely pubescent (hirsute), ciliate along the edges, or completely glabrous. Flowers white or pale pink, stamens exserted by 5-15 mm. Distribution: Transvaal, Swaziland, Lesotho and Natal. Notes: Haemanthus carneus has the same growth pattern as Haemanthus humilis, but it has filaments which are included within the perianth and are only half as long as the segments at anthesis However one wonders whether H. cameus should be considered separate from H. humilis on the basis of the small difference mentioned above, and often regarded as part of H. humuls. 4) Pacific Bulb Society contributors "Haemanthus humilis" Pacific Bulb Society Wiki <http://www.pacificbulbsociety.org> version March 27, 2014. Web. 11 January 2017. 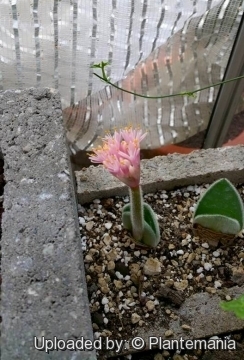 5) Mainly Amaryllids Garden “Other List Bulbs” http://www.mainlyamaryllidsgarden.com/othernotes.php Web. 11 January 2017. 8) Journal of South African Botany Supplementary Volume 12: 33 (1984). Cultivation and Propagation: In cultivation, Haemanthus humilis grows in the winter (even from seeds). Plants are easy to grow if kept pot-bound and in part shade. Mature plants are happy and will flower in a 10 cm pot. Plants sown from seeds will flower in 4 years. Soil: The growing medium must drain sharply e.g. a mixture of equal parts of coarse river sand or grit, and finely sifted compost. This species is not particularly fussy as to soil pH. Watering: This species requires autumn and spring water, dryish during the winter, and is happy with a dilute amount of fertilizer during growth. The summer dormancy period tends to be short and the soil should be kept dry, although the bulbs seem happiest when the soil does not go bone dry. Exposure: It should be grown in part shade. winter-growers do best in pots. by gentle tugging, not forcible pulling, and treat any damaged surfaces with a fungicide. Replant as soon as possible.